ikebana 生け花,　いけ花, 生花　literally "living flowers"
hana o ikeru　花を活ける literally maybe: "to bring the flowers to life"
In Japan, one of the oldest uses of arranging flowers in special vases was used by Buddhist monks to decorate the altar. Flowers were one of the special offerings to a Buddhist deity, apart from light (candles) and incense. Obviously ancient China influenced Japan strongly, just as we in the West were influenced by Ancient Egypt, Ancient Greece and Ancient Rome. This is also true of Ikebana, "The Way of the Flower" (kadoo 花道）. The early ideas travelled to Japan with Chinese monks but the formalisation of the Art occured through many generations of devoted Japanese Masters.They developed progressive new forms from basic principles that had been set. Schools were set up to pass on the heritage to new generations and these became the workshops where the art was distilled to its essence. 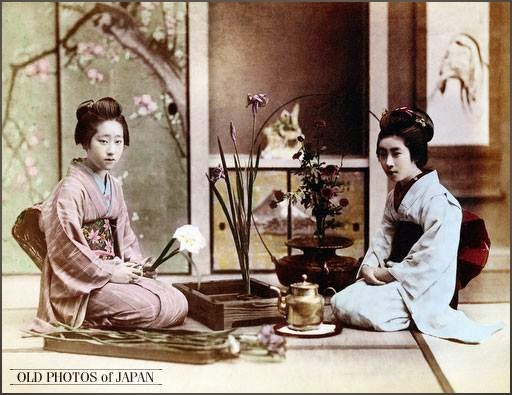 The origin of Ikebana stretches back over 500 years. The oldest Ikebana manuscript, "Kao irai no Kadensho" dates from 1486. The famous "Senno Kuden" manuscript, by the founder of the Ikenobo School of Ikebana, was written in 1542. Since this time, many styles have appeared, disappeared and developed. In the Kamakura period (1192-1333), the Samurai (elite warrior class) wrested the power of government from the aristocrats and brought great lifestyle and fashion changes into the whole of Japanese society. 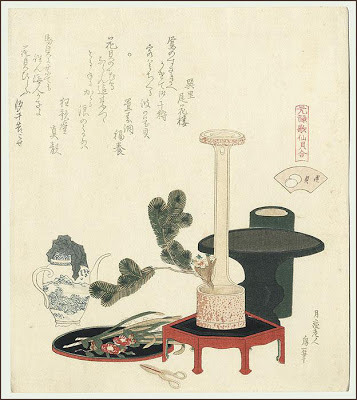 Read more about the history of Ikebana and the different schools in Japan. not in the way Japanese ikebana is done.
. . . . . As I pondered the eyeless dolls, and the symbolism associated with them, and what Japan is dealing with in the wake of the recent disasters, the themes of vision and resilience emerged. Exhibition of Haiku and Ikebana in Germany. Erika is/was a member of our World Kigo Forum. Homepage von Erika Schwalm, Riji Meisterin der Sogetsu-Schule Tokyo und Leiterin des Frankfurter Haikukreises. 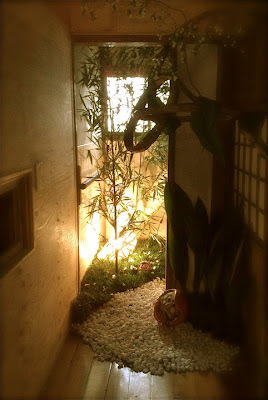 She loves nature and the Japanese gardens and tries to combine various arts, like music, ikebana and haiku. 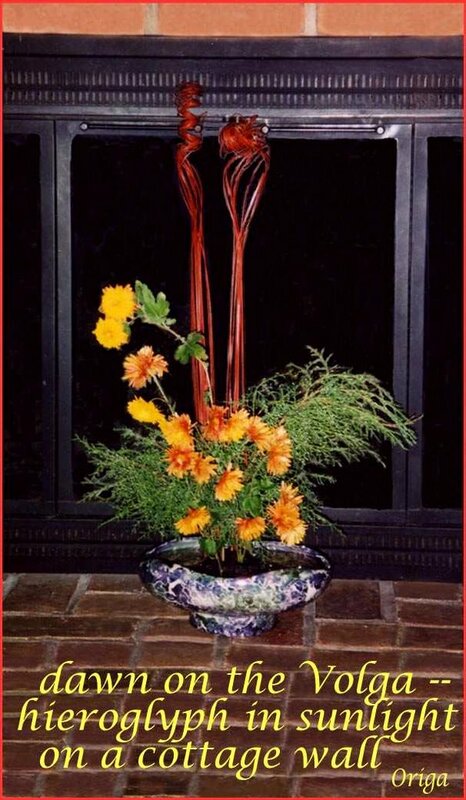 During a haikai meeting in the Edo period, it was custom to perform an ikebana arrangement after the guest of honour had written the first poem (hokku　発句) with a seasonal hint. Rikka style was established in the Muromachi period, in the 15th century. 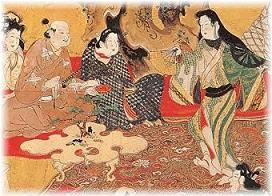 It is said to be the foundation of Ikebana, from which Shoka, Moribana and Nageire styles evolved. 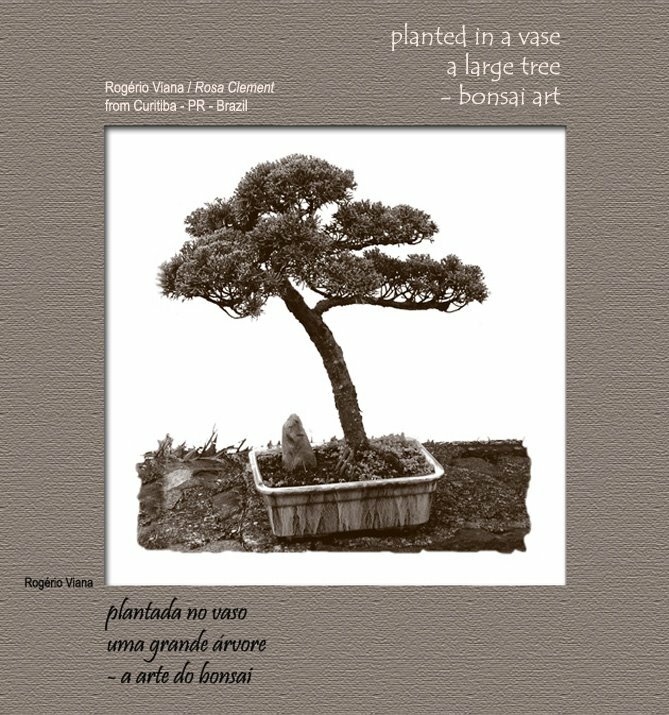 is the art of aesthetic miniaturization of trees by growing them in containers. Originating in Chinese penjing (Chinese /Japanese bonkei : 盆景, "tray scenery"), Japanese bonsai developed its localization of techniques and aesthetics after its introduction to Japan by imperial embassies returning from China in the ninth century. 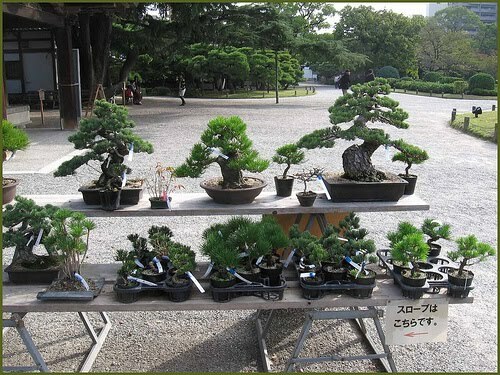 In Western culture, the word "bonsai" is commonly used as an umbrella term for all miniature trees.
. Takamatsu Bonsai Exhibition 2008 . Iit can be filled with stones or other things too that make us feel cool in summer. Sometimes small crabs can swimm in it. It is mostly made of pottery or metal.
. . . CLICK here for ikebana suiban Photos ! A miniature landscape garden, prepared in a box or basin with tiny plants, stones, miniature houses, miniature bridges, etc. It lends a feeling of coolness to a room in summer. Yumedono cactus, Haworthia emelyae, ハオルチア. in my landscape garden . . .
. hakoniwa gangu 箱庭玩具 toy tools for a landscape garden .
. keman 華鬘 flower garlands .
. Erika Schwalm <> In Memoriam . Seriously, though, I think it's a fine art, indeed. So many things we can do with a sense of poetry! 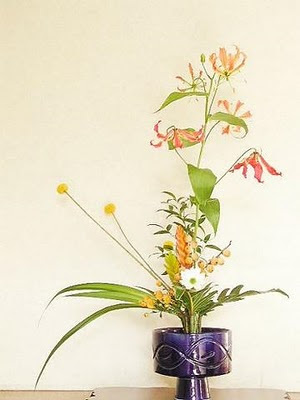 One of my explorations led me to take some lessons in "Ikebana", the Japanese art of flower arranging. 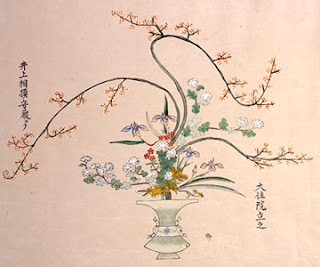 During my brief training my teacher told me the following: "In contrast to the massing of blooms typical of flower arrangements in the West, Ikebana is usually characterized by a line of twigs and/or leaves, connected by a sparse arrangement of flowers. The idea being to give the viewer the sense they have come across a scene in nature." 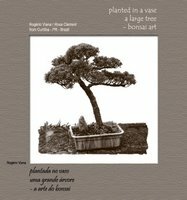 "In Ikebana it is common that one of the branches in an arrangement is bent or broken, to signify the practitioner has attempted to present the arrangement in a 'natural' state. It is the 'imperfection' of the broken branch that leads us to understand the practitioner is striving to express 'perfection' as it appears in nature. By viewing the arrangement it is hoped you might come to appreciate that your own 'broken branches' are what signify your uniqueness and beauty. "Each one of us, no matter how successful or evolved we might appear to be, have imperfections and personal ego attachments. These imperfections and attachments are not something to be overcome or transcended, but rather aspects of our self to be understood, appreciated, and accepted. If we do not honor and appreciate our human frailties as an essential part of who we are, we will always be attempting to erradicate some aspect of ourself that we perceive to be lacking." "Consider the sense of perfection and pure life force you get when holding a baby. It's the baby's uncontrived and unrestrained expression of their emotional experience that gives us a sense of life at its fullest. This is the inherent blessing that exists as the essence of life in its simplest and purest form. Rather than hoping for love or acceptance, the baby expresses who they are and what they feel, in this very moment. This is the same free flow of energy that the Ikebana practitioner strives to express in their floral arrangements. We look to strip our work of any contrived sense of beauty, so the natural energy and life force of the flowers can be freely expreessed and felt. In other words, we attempt to present the flowers 'as they are', rather than attempting to add anything extra. We strive to let the flowers communicate directly, and thus in some way hope to reconnect the viewer to their own heartfelt sense of beauty and perfection." At the conclusion of one lesson my teacher said, "Today, there is one more thing I would like to say. I am drawn to flower arranging because it helps me understand and come to terms with the impermance of life. No matter how beautiful the flowers appear to be when the arrangement is complete, I know they will only express their beauty for a few days time. By carefully cleaning and cutting the flowers and adding water, we can extend their life for a few precious moments. But in the end you're left with the understanding that neither the flowers nor any other form of life will last forever. One of the most important things we can do in life is appreciate the beauty and perfection that is present in our lives right now, rather than lamenting the passing of life. By appreciating the fleeting beauty of the flowers, you can come to understand the fleeting beauty of your own life, and the lives of those you love." Near a pond (ike) where Prince Shotoku bathed, the small hut (bo) of succeeding generations of Buddhist priests gave rise to the name Ikenobo . 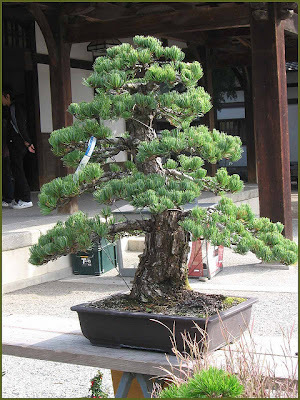 The Rokkakudo is the site of the birth and development of ikebana. The custom of appreciating flowers in a vase probably dates back almost to the birth of the human race. Involved in this custom is the human characteristic of loving and adoring the beautiful. In this regard, there is no difference between East and West. In Japan, however, arranging flowers has been carefully considered as the art form and, indeed, way of life called kado (ka, flower; do, way or path).